It is with much pleasure that I announce the release of Hard Ops 9: Radium. While many things have changed we hope to keep the same experience. Gumroad Customers: The top file is always the latest version. Blender Market Customers: the file…. I should mention here booltool is no longer needed / required for Hard Ops. We support it however certain features require it not be enabled. After the release of Hard Ops 0087 we immediately got to work on the next version working to unify things on a level that makes the workflow easier to explain and use. I plan to release videos for this version when possible to help explain but I will attempt to in this update log. 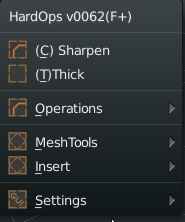 Let’s begin with the Hard Ops preferences in the add-ons panel. The hotkeys of Hard Ops are now listed in the preferences. It is recommended to uncheck them to disable them. (Do not click the Xs). This shouldn’t be needing any adjustments and is experimental. The addons panel and which ones are recommended is also updated .The main change is the decalMachine. Clicking the Hard Ops link will get you a discount on the product. To find out more about decalMachine check this link to find out more. Ok so with the addon prefs aside lets get to the T panel. The Hard Ops learning tab is there for users to find out more on how to use Hard Ops and get help. I hope the learning tab can be useful in helping more people get started with Hard Ops. Now lets get into Hard Ops and the Q menu. The Q menu has went through some changes. As you can see all options are listed however the context. For example merge and cslash (formerly rebool / cslice). These options are particular and will do nothing if the context is not correct. But another thing to note is Cstep / Sstep / CBake are gone. The cstep / sstep workflow is now simplified into the Csharpen / Ssharpen / Step workflow. Basically Step will bake the bevels and set up the bevel modifier in addition to putting the mesh in Cstep mode. To demonstrate this in action. This is the normal boolean / Csharpen behavior. Just perform a boolean action and press Q and Csharpen. Also note the boolean object became sstatus: boolshape. This give the boolean object a special q menu. I bevelled using a neutral bevel instead of csharpen bevel due to the cutting of weights into geo is not recommended. To take this a step further lets Step and then do a boolean and Csharpen again. Then use Step to bake the previous bevels and then adjust the bwidth of the new bevels. This is not much of a departure from the previous workflow except now ssharpen and csharpen work with cstep meshes. So the other operators were not needed. This should make the learning process easier for beginners especially. CSharpen and Ssharpen now work on multiple meshes. As does Bwidth. In the T panel and (ctrl + ~) Modifier Helper is an Sharp tab. 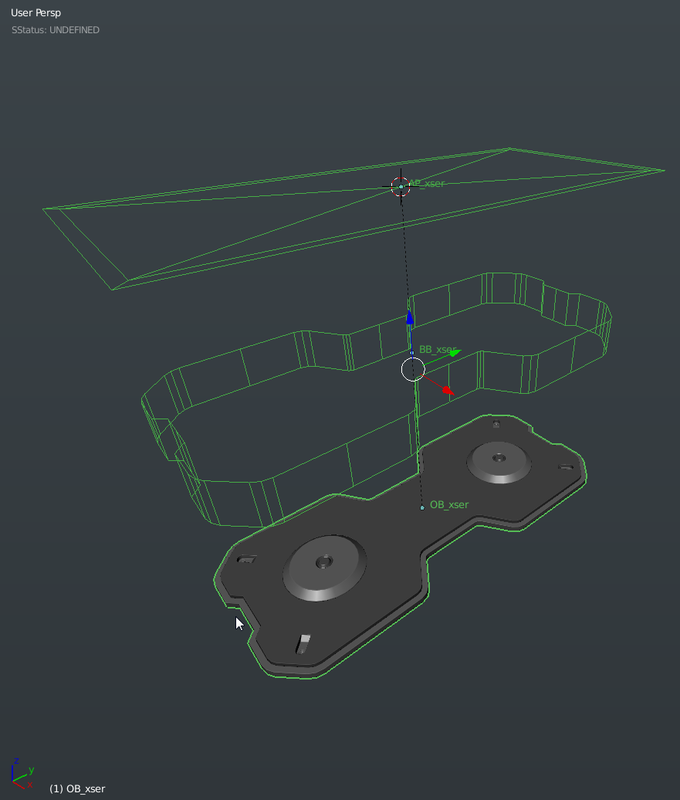 This allows you to set the sharpeners S/C and step’s angle parameter. This can be useful in cases where you need a higher number before doing an operation. This makes the Hard Ops workflow much faster and easier to work with. Here is an example of how it can be used. The easiest way to explain what is going on is. Changed angle using Mod Helper Sharp area to raise to 45. Bwidth has also seen some enhancements. In addition. You can use Bwidth to turn off bevel modifiers by pressing V. In fact pressing H will show help. This is for all modal operators. There are even more enhancements beyond this that I am sure am missing. On a technical level they perform even better with heavy scenes than before however with so many changes I expect glitches. We added an option to reset an object on an axis. It comes in handy for orienting things on the x axis which is it’s main purpose. This was also an important feature that I am quite pleased with. In short. This will convert sharps to seam / bevel mark / sharp / subdivision crease. This can be useful when using subdivision to block in a model and then applied and used with beveling which I do alot. This panel looks complex but really the top is all that matters. In my typical use cases I am holding shift and clicking sharp on the left side and selecting all the options on the right side. 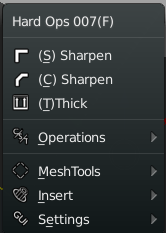 When using subdivision block in and applying it via alt + c or clicking on the apply button of the modifier all the ssharp edges get converted to sharp edges so the converter just converts them back. The misc tab has been populated with options. This will be useful for using this in full screen mode and accessing quick options. In this screen all options are expanded for effect. I’ll go over what they mean. Bmesh is nicer but less stable / Carve is completely stable but gives undesired edges alot of the time. Modal Scale – Sets the modals to a multiplier for working with meshes larger than usual or smaller. This is ideal for scale modelling or accuracy. Status – sets the sstatus of the mesh. Replaces sstatus override. Set smooth / flat shading / autosmooth angle and enable autosmooth. There is still more we plan to do with the helper. It has opened the door for a whole world of functionalities. The modifier helper concludes a 3d long dream of being able to mess with modifiers without the panel. The material helper is also working better than before. Cutting Material is where you can specify a material to cut into another object. This was covered in the last version where it made its debut. Sometimes when I finish a model I want to divide / multiply all the bevels present. This option fulfills that need. All selected objects will have their bevel width multiplied by two. Or divided with the checkbox which can also add some realism depending on context. At the top of the screen it used to tell the sstatus of the object however this proved to be confusing to this has been replaced with a discreet logo for notifications. I want to expand its uses however this is the initial implementaion. Someday it will do something in addition to be colored for notifications but that is for down the road. It is barely visible when the mesh is not in a sstate from Hard Ops. This should provide some assistance to following future tuts and understanding the upcoming “modes”. Renderset 1 is my default render setup I use for tutorials and basic rendering. It has been expanded to use filmic. This is just the way I render and can help with setting up renders. GPU recommended. This will hide ssharps from showing in edit mode. This was requested a while back. Only a visibility change. No sharps are affected. If you need to adjust what edit sharp does the T panel allows this. You can also set it in the (ctrl + `) modifier helper. Other than that there were no other notable edit mode changes at this time. Things are planned however but planning is required. With that I conclude this update log and can’t wait to show whats next for Hard Ops. This has been a steady refinement over time and not a day goes by where we aren’t discussing what next to do with Hard Ops. I am honored to have received so much support over the course of the project. The community keeps this tool alive. Also if you are curious of the official changes internally there is release_log.md file you can open in any text editor or even blender’s text editor. So 0065 is the intermediate version on the way to 007 of Hard Ops and has more than enough to keep everyone excited. I wanted to make a post just linking some of the artists who are giving away fantastic things worth checking out. I’m sure there’s many many more missing here I could be listing but those were the ones I liked and was most grateful for. Feel free to make a donation and support them. They are all free so there’s no reason to not download them all! edit: i forgot to add myself! I got some freebies too! So for this post I wanted to share a sneak peek of the near final upper body before final refinements and then texturing. It is for the film I was so lucky as to be given an opportunity to be a part of. Of course the final versions will be narrated. I did a unique type of UVing that worked around the materials that I set up during modelling. 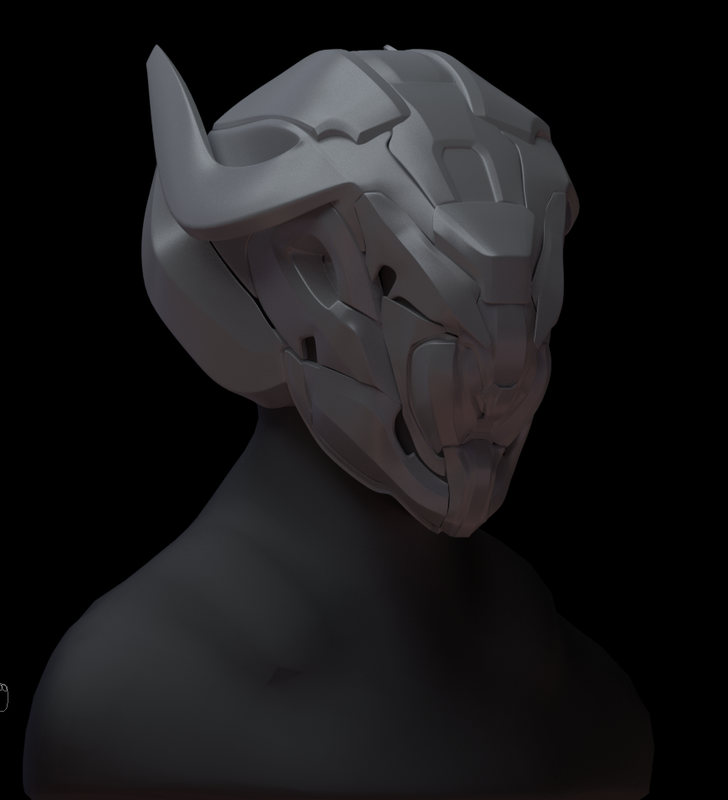 I found this to be slightly easier but we will know during the UVing and texturing phase. Also for UVing I have a tutorial that explains my workflow in depth. I am going to be releasing the full course soon to gumroad which is a direct sequel to my last tutorial course for DPS on using Zbrush/Substance Painter/Blender. This course hopefully will expand on that knowledge and demonstrate my workflow in creating a character that in my opinion is superior to the first in both modelling and execution. I have also been honored to get advice from professionals on design aspect and how to effectively showcase the character even under all of that armor. So recently I discovered this software called Paintstorm that is just amazing. The behavior of paint style behavior on each and every pixel that the brush touches is inspiring and intuitive. I am not a concept artist by any means but the acquisition of this fine program is just the kick I needed to move forward. I definitely recommend going to their site and picking it up! In other news. I have been so lucky as to get mentoring from Anthony Jones on design and art in general. He has taught me so much in a limited time that its staggering so I’ve been hard at work on refining and pushing my style to the next level. At this same time I have also expanded my software collection even more and am even becoming more familiar with fusion 360. It’s definitely a learning adventure finding out how real parts are made. 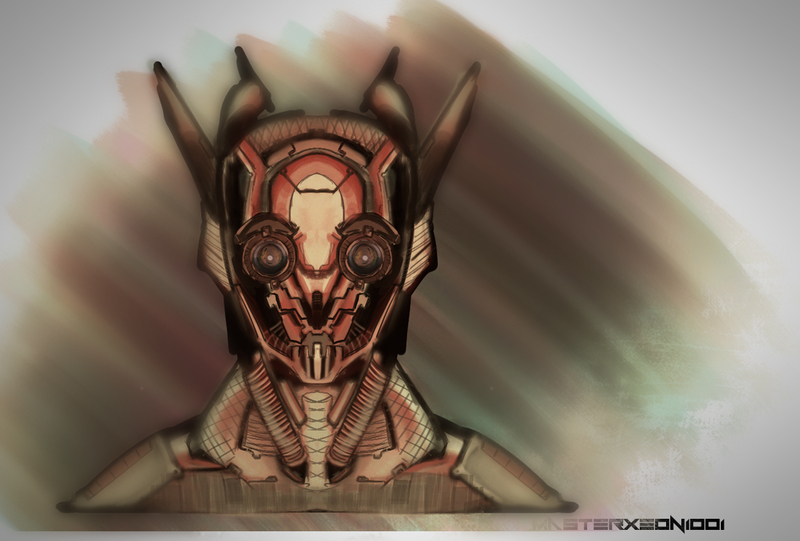 I did this helmet as a test to get better at overlap and making more unique designs. I plan to release the timelapse soon on YouTube after narration but I am already digging the look before refinement. So while I’m yammering on I am also giving away stuff over at my Patreon if you’re interested in supporting me more closely on my journey as an artist. But for the people that are in support I am working night and day to give them inside access, materials, clothes, mech parts, models, etc. So also check that out if you’re interested. I would like to thank everyone for their continued support. It’s the people that keep me going with this endeavor even as working day and night makes my body hurt haha. But seriously I’ve been hitting the PC extra hard this month so I’ve been quiet these last couple of days but I can’t wait to drop gold on my patrons and silver on my community. 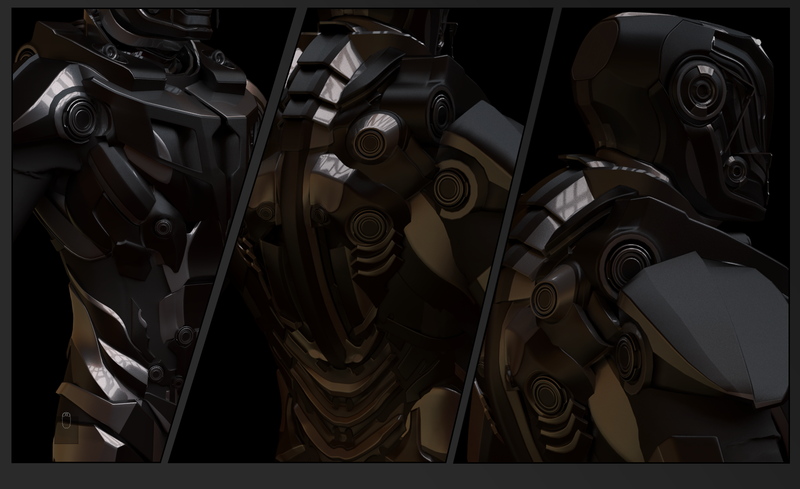 I have also been doing some studies in Substance Designer to get more acquainted and fast but something I have been enjoying lately is Unreal Engine and sbar support. By installing this plugin for substance support in Unreal you can import just sbars and deal with textures without linearzationi ssues or graph tomfoolery. 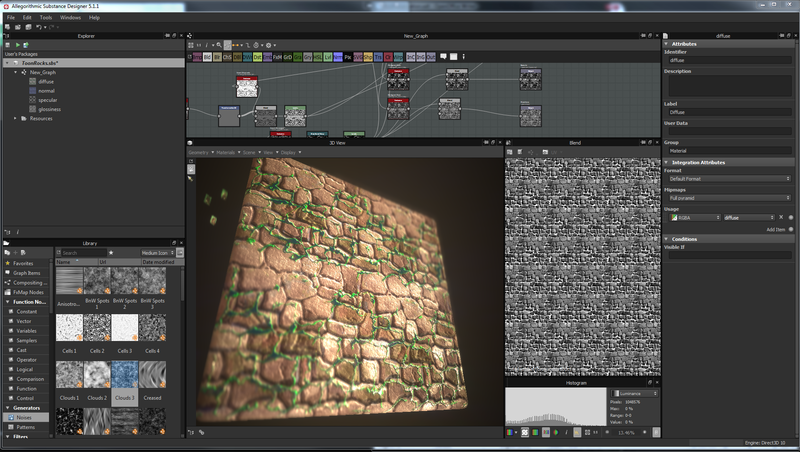 I have just fallen in love with this since it just goes to show how important substance designer is in one’s pipeline. For another reason to use substance designer let this man explain it. Really I think this is the future. Having 4-8 maps per asset and multiplied across characters can be a tedius thing to deal with and manage and this workflow is the future in my opinion and is worth a look. Allegorithmic is even having a sale right now for 40% off! So at least try the demo. Its complicated because its awesome. Also for my patrons I am working on some sbars to throw up as well based off of stylized textures I have been admiring. One of my pastimes is taking classic textures and converting them to full PBR. 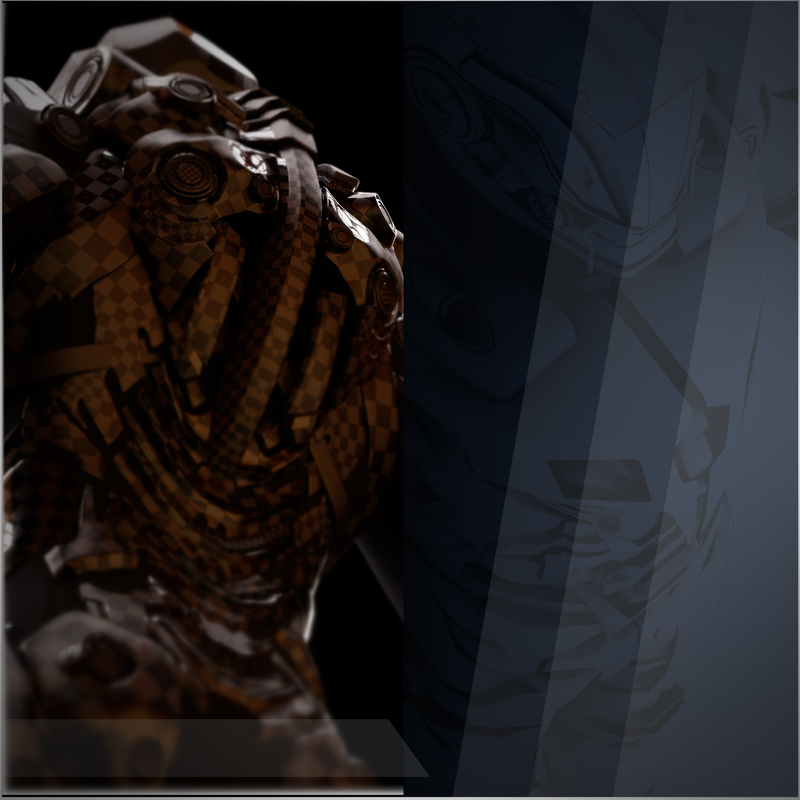 So patrons, expect this little sbar soon to test in UE, Maya, Marmoset, and Unity! Still getting the grasp on making that epic mold that substance designer is known for making but that’s all for tonight! Ugh… I’m still here. Hahah just kidding! The fabulous Skin Vibes has come up with the most marvelous of theme songs for “The Servant” (details coming soon) but I am always impressed with this man’s work. He’s also a Blender user so thats always a plus too!